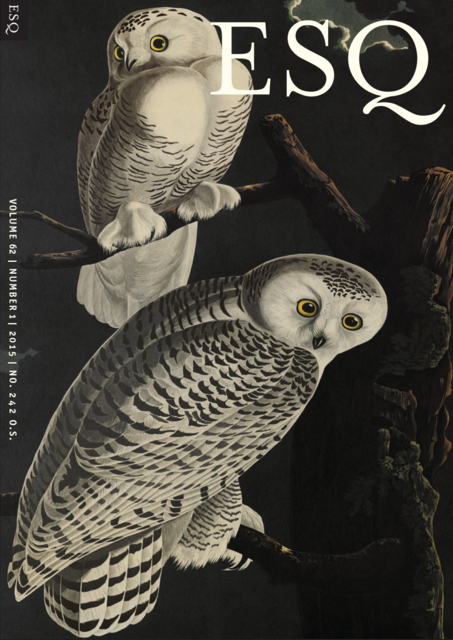 The oldest professional journal encompassing nineteenth-century American literature, ESQ began by focusing on the American Renaissance’s traditional figures, and it continues to embrace scholarship that emphasizes Emerson, Thoreau, Melville, Whitman, and Hawthorne. Over time it has expanded its scope to include nineteenth-century American literature and culture more broadly, publishing essays on such subjects as women’s health, ship captain’s wives’ diaries, and transatlantic land claims, and on such writers as Lydia Maria Child, James McClune Smith, George Lippard, William Wells Brown, Julia Ward Howe, and Sarah Piatt. ESQ invites essays that illuminate any aspect of American literature and culture in the long nineteenth century. Submissions that foreground writers/subjects/texts outside the 1800-1899 period should ideally connect to that era’s concerns: thus, those that begin before 1800 might explore how a writer or movement anticipates or helps inaugurate an idea, genre, or concern that only later emerges fully, while contributions focusing after 1899 might indicate how a nineteenth-century writer/idea/genre exerts continuing authority. The journal also welcomes submissions that conceptualize alternative American renaissances, that focus on Southern, Western, or Midwestern literatures, or that explore one or more ethnic American literatures. While ESQ encompasses such familiar theoretical approaches as new historicism, reader response criticism, borderlands studies, biographical criticism, ethnic studies, and cultural studies, it encourages submissions that feature newer methodologies, including ecocriticism, transnationalism, animal studies, disability studies, materialist feminism, mobility studies, periodical studies, anthology studies, and affect studies. We also seek proposals for special issues that either address a coherent subject area or exemplify a particular theoretical approach.